Nutritious and Delicious Recipe of the Week: Fuel Your Body and Your Workouts With Faux-Oatmeal! Home / Blog / Nutritious and Delicious Recipe of the Week: Fuel Your Body and Your Workouts With Faux-Oatmeal! It’s #what’scookinWednesday again, and in the Fit1 kitchen we are testing out a few new recipes to keep us warm, toasty, satisfied and ready for our workouts on cold winter mornings! This recipe for “raw” (but warm!) 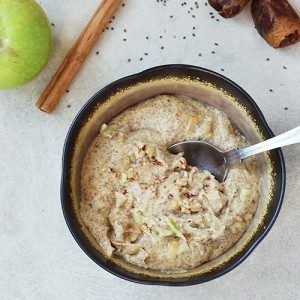 Apple Pie Chia Seed Porridge takes about 10 minutes to prepare, but it’s worth it! Wake up a few minutes early tomorrow morning, turn on some relaxing music, blend up some breakfast, and then take a few moments to relax and enjoy your delightful and oh-so-healthy breakfast! A delicious, warming breakfast that just so happens to be super healthy for you! Suitable for everyone, including those on raw, vegan and gluten-free diets. Recipe courtesy of wallflowergirl.co.uk. 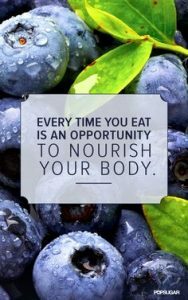 Check out her awesome blog for more delicious and nutritious recipes to keep you on track with your healthy eating plan this winter! Mix all of the ingredients, except the chopped nuts, in a blender until thick and smooth. You’re only one workout away from a good mood, enhanced self-esteem, and improved fitness! Join the Fit1 Bootcamp team in our Etobicoke/ Toronto gym for classes year round, indoors in the winter, and indoors and outdoors in the summer.